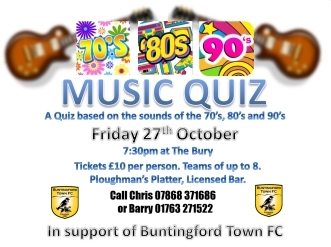 The club will be holding a Music Quiz based on the sounds of the 70's, 80's and 90's on Friday 27th October. The event will be held at The Bury, which of course has a licensed bar, and will start at 7:30pm. Tickets, priced at £10 per person, are available from Chris (07868 371686) or Barry (01763 271522); a ploughman's platter for each table is included in the price. Teams of up to 8 people are allowed, so there will be every chance to record a good score and finish the evening at the top of the leaderboard. Is your team good enough to win our second music quiz of the year?